When you're looking for a way to change up your thigh workout and stay cool at the same time, exercising in the pool might be just what you're looking for. 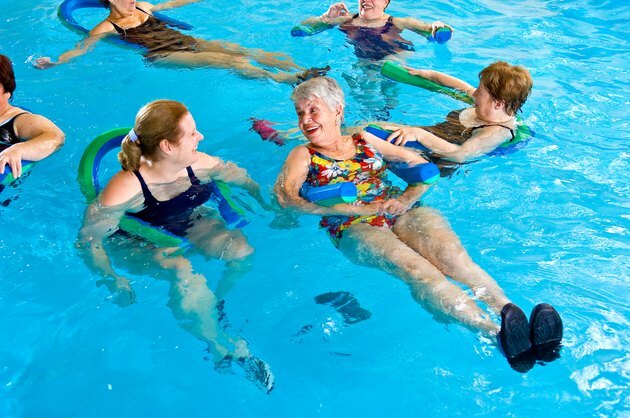 Though the water has built-in resistance, exercising in the pool is low impact and thus easy on your joints. Just because you're having fun in the water doesn't mean you're not working out -- leg exercises in the pool pack a powerful punch. As with land exercise, warming up before you jump into your exercise routine is essential. Walk briskly or jog -- in or out of the pool -- for about five minutes, or swim a few laps before you start targeting your thighs. Swing one leg for about 30 seconds, starting low and gradually increasing the height of the swing, to get those thigh muscles warmed up. Switch to the other leg before you start your workout. You might already perform leg lifts on the floor, but doing them in the pool allows you to add extra resistance from the water. Stand with your back by the side of the pool so you can hold on to keep your balance and then lift one leg straight out to your side, as high as is comfortable. Do two sets of 10 repetitions and then switch legs. Go back to the first leg and lift it to the inside so it crosses in front of your stable leg to work your inner thighs, for two sets of 10. Repeat with the other leg. The depth of the water isn't too important when doing these exercises; however, it needs to be higher than you can lift your leg so you encounter resistance at all points. Waist-high water typically is sufficient if you don't like deep water. Using ankle water weights or wrapping a noodle around your ankles adds resistance to this exercise. Jumping in the water is safer for your joints than jumping on land; it can reduce the amount of weight your joints bear by up to 90 percent, according to the American Council on Exercise. You may do squat jumps, which work your quadriceps and hamstrings, the same way you would do squat jumps on land. The water should be about waist deep or slightly higher; however, it shouldn't come over your head as you squat. Hold your arms out to your sides or straight in front of you and squat, but don't allow your knees to move past your toes. Raise your arms over your head and jump up to land in another squat. Repeat 10 times. Side jumps also work your inner and outer thighs. Squat about halfway down and then jump about two feet to one side, extending the other leg in a side lift as you land. Do four jumps with each leg. If you're a strong swimmer, get in the deep end for some more thigh-toning action. Treading water helps build your thigh muscles, especially if you try a K-tread motion. Make small circles with your hands to steady yourself and then kick one straight leg up to waist level while pointing the other toe down toward the bottom of the pool. Hold for about five seconds and then switch. Do two 30-second sets. Jumping jacks also help engage your thighs, especially if your feet don't touch the bottom. Bounce in the water, using your arms for some lift, and move your legs in and out as if you're doing jumping jacks. Tighten your abdominals to keep you from tipping forward or backward. Perform two sets of 10 repetitions.